When it comes to movie theater etiquette, I am of the most disciplined. My cell phone is turned off, all attention is directed toward the screen, and I have such an aversion for people who talk during movies that I almost always go alone to help amplify the silence. With that said, I still cheered aloud more than once during Creed. Anyone familiar with the Rocky films will instantly recognize the name for which Creed gets its title. Champion fighter Rocky “The Italian Stallion” Balboa (Sylvester Stallone) first encountered boxer Apollo Creed (Carl Weathers) in the franchise’s first picture, Rocky, in 1976. What started as a rivalry eventually blossomed into a friendship, with Apollo Creed making his final appearance in Rocky IV. After that followed two additional movies, finally bringing us to Creed, a film that celebrates the legacies of both Rocky and Apollo, while equally serving as a pass-the-torch moment in Rocky’s decades-long story. This time around, director Ryan Coogler reunites with his Fruitville Station star Michael B. Jordan, portraying the love child of an affair Apollo Creed once had. When we’re introduced to our main character, we see a rebellious youth whose scrappy ways keep him in juvenile detention. Born under the name Adonis Johnson, the young man’s life makes an about-face turn when a woman enters the picture, requesting to take him home and raise him in a loving environment. The woman identifies herself as Apollo Creed’s widow, Mary Anne (Phylicia Rashad). Although she isn’t Adonis’s birth mother, Mary Anne takes him under her wing and raises him as her own. Mary Anne wants nothing more than to see Adonis succeed in any field other than the one his father was famous in, but, true to his roots, Adonis won’t be satisfied until he can become a boxer—one who could rival his own father’s legacy. Though Mary Anne protests, Adonis sets off for Philadelphia to find Rocky Balboa and ask for his help in becoming the boxer he’s always aspired to be. This Rocky Balboa isn’t the one we’ve seen in previous films. This Rocky is worn, weathered, and content with living a quiet life while remaining Philadelphia’s champ. Upon introduction, Rocky is surprised but happy to know that Apollo Creed has a son who wants to honor his father through fighting. He’s hesitant, however, and has to tell Adonis the unfortunate truth: He just doesn’t have any fight left in him. With persistence, Adonis eventually convinces Rocky that, through training, this is something they both need to make their lives whole. Creed does a wonderful job at making us sympathize for an aging character audiences have known for ages. You can’t help but watch Creed and think beyond the screen, pondering over how age affects fictional and non-fictional people alike. Creed parallels 1976s Rocky in so many ways, but it does so in the name of admiration and respect. We live in a world of generic remakes and “reimaginings”, and this is certainly not the case when it comes to Creed. 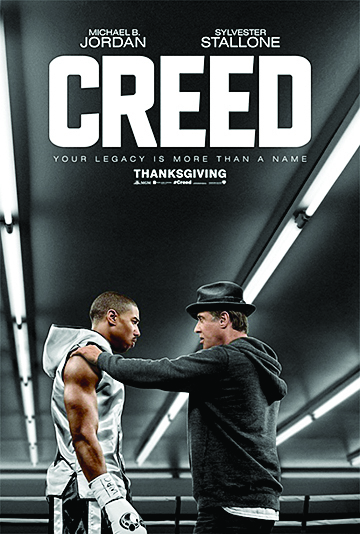 By the film’s finale, Rocky has trained Adonis for the fight of his life (so far) and Adonis agrees to adopt Creed as a last name, completing the pieces of a once-broken life. As the saying goes, every new beginning comes from some beginning’s end. Creed is such a good movie, that I hope this is the case. As time progresses, it’s inevitable that we see less of Rocky Balboa. With that said, the world would be a better place if, down the road, we see plenty more of Adonis Creed.